The Top Banana Band returned to the Gretton Music Festival as headline act 2016. 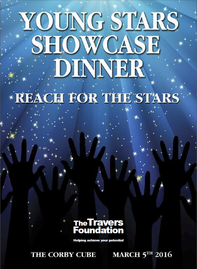 ​All proceeds from their show went to support The Travers Foundation. Their live debut was at the 2015 Festival when they performed at Monday's Open Mic at The Hatton Arms. This 9 piece band plays soul, funk and rhythm & blues. ​Formed over their mutual love of The Blues Brothers and The Commitments films, The Top Banana Band play a wide range or funk, soul and blues. Formally known as Mustang Barry their name was changed when a shipment of inflatable bananas came into the band's possession. The Top Banana Band gave us all a great time with everyone up and dancing. Click to see lots of pictures and more information. The Mid Summer Ball at Barnsdale Lodge was a huge success. We raised over £6,000, and every penny will be spent in supporting talented youngsters improve their skills in sports, the creative and performing arts. The charity is entirely staffed by volunteers, and we all work really hard in various aspects of fundraising, working with the young people and their families and in PR and marketing. We would like to take this opportunity to thank everybody who made this evening the resounding success it was, especially the ​Event Sponsor Electrical Compliance & Safety Limited, The Top Banana Band, Auctioneer David Palmer, Matched Funding Donor Tina Clark from Lloyds Bank, Corby and Auction Donors Barnsdale Lodge Hotel,Coca Cola Enterprises, Philip Day, Ryan Evans, Steve Farr, Rab Fearnie, David Hall, Jane Harrison, Diane Masters, William Sharman, Silverstone Racing Circuit, Rob Sutton and Gary Tait.